Lisa and I played a two-player game of Thurn and Taxis: Power and Glory last night and I got whipped but good. 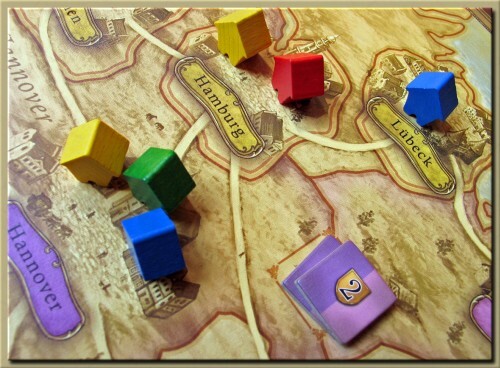 Power and Glory is an expansion to the base game Thurn and Taxis. However, to call it an expansion is somewhat of a misnomer. Power and Glory is to Thurn and Taxis as Ticket to Ride Europe is to Ticket to Ride. No stagecoachesIn Power and glory you aren’t attempting to build routes in ever increasing lengths to efficiently pick up stagecoach cards. Power and Glory imposes no rule that encourages (directly or indirectly) players to build routes in any particular lengths throughout the game. Because there are no stagecoach cards, the cartwright’s special powers aren’t used in the game. Building your coachPower and Glory adds a route limiting feature by requiring players to play cards from their hand in one of two places: 1) your route or 2) as a set of horses pulling a carriage. When players cash in a route, the route cannot exceed the number of horses pulling their carriage. Cashing in a route causes not only the route cards to be discarded but also the horse cards pulling your carriage. A side effect of the carriage limiting feature is that it allows players to discard bad cards on their turn rather than being forced to play a card on their route. The base game was rather brutal if you were left stuck without a route card play by forcing you to throw away your route without cashing it in. This ‘discarding’ ability is a welcome change. There are minor changes to the map with the addition of a single province that has two separated lobes. There are also some ‘free’ cities that are not part of any province that grant the first office a 1-point token. Power and Glory is a strong game on its own without the base game. I like both games but I might give Power and Glory the nod given the addition of the ‘discarding’ ability. 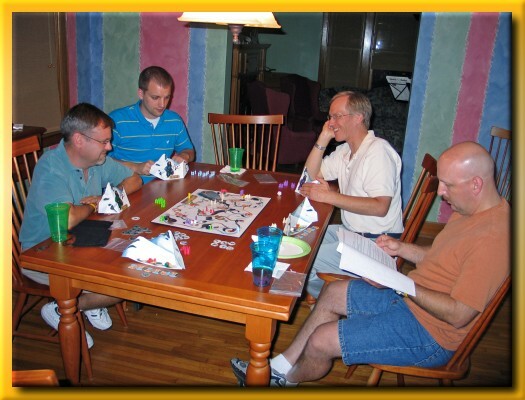 I hosted August 2007’s Game Night at my house tonight. Jason was new to the group but I’d convinced him to give us a try. He’s played Settler’s of Catan many, many times as well as Railroad Tycoon so I didn’t suspect he’d have any problem at all picking up the rules to some other games. We started off with Ra by Reiner Knizia. This game has had an on-again/off-again lifetime in my group but tonight I think everyone would agree that it was pretty fun. I like how the game is very easy to teach and it moves very quickly. It’s a little tough for new players to understand what’s worth bidding for and for how much but at least there isn’t a steep learning curve for the game. We almost played another game of Ra as our second title but we ended up playing Himalaya for 5. I like this game but it tends to be quite cerebral but I’m not sure if all the effort is worth what at times feels like agony. The decisions can sometimes be tough but in many cases, it might as well be a coin toss which one turns up being the more correct one. The end-game scoring is a quite strange and can be quite eye-opening if you don’t plan (or misread someone’s position) for delegates being removed from the board when a player doesn’t make it through the scoring of religious influence. In my next attempt at this game, I’d like to play with the religious influence points inverted from the written rules so that small villages score 3 rather than 1 and large temples score 1 rather than 3. The number of delegates you’re allowed to place would remain, however, the same as the written rules. With this variant, the entire board becomes valuable (for differing reasons) rather than forcing contention into just the larger sites. 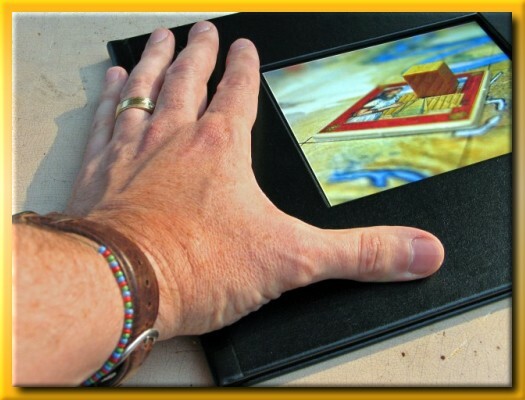 BGG user gollum‘s great geeklist holding “coffee-table-book-images” got me thinking about creating a real tangible book. So, I gathered 55 of my favorite images from BGG, added borders to provide a common theme to them all, and uploaded them to MyPublisher.com. The end result arrived today and I have to say I’m very happy with the results. Okay, I’m not just very happy…I’m ecstatic. I know I’m strange but man this thing is so cool! The leather cover is very nice and the binding appears strong. The print quality is better than I expected with the image resolutions I had to work exhibiting little to no pixelation that I can detect. I chose the middle size at MyPublisher (mainly due to cost and the resolution of the images I was working with) resulting in an overall cover dimension of 8 3/4″ x 11 1/4″ x 1/2″. 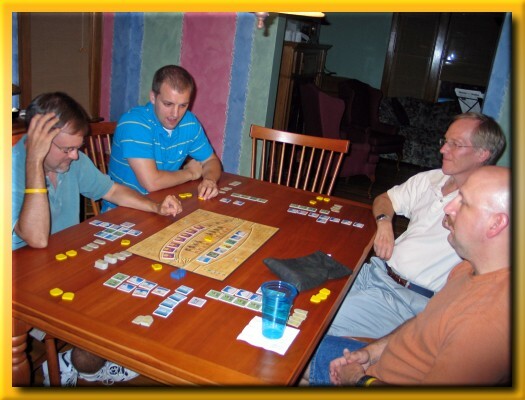 I am a great fan of board games and of the online community that has developed around them at BoardGameGeek.com (BGG). In this book, I’ve selected approximately fifty images, submitted by myself and the community, that I wanted to preserve in a tangible form. There are thousands of games, thousands of images, and thousands of community members supplying content to BoardGameGeek and selecting these images was a difficult task. 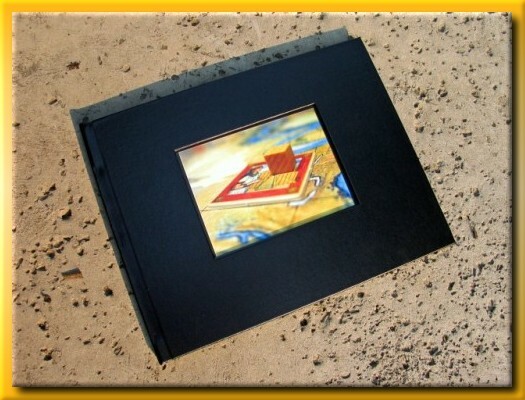 Many of the images have had a border added to provide continuity to the book as a whole. However, the base image remains consistent with that uploaded to BGG. With each image I have supplied the name of the game, the name of the designer, and the BGG user name of the image submitter. I hope you enjoy this collection of board game art and most of all, I hope it encourages you to find out more about these games. I’m extremely happy that I took the time and effort to organize the book and now I have something that I can set out on the coffee table and take with me to show off this great hobby. Please visit My Coffee Table Book Geeklist on BGG to see some of the individual images.